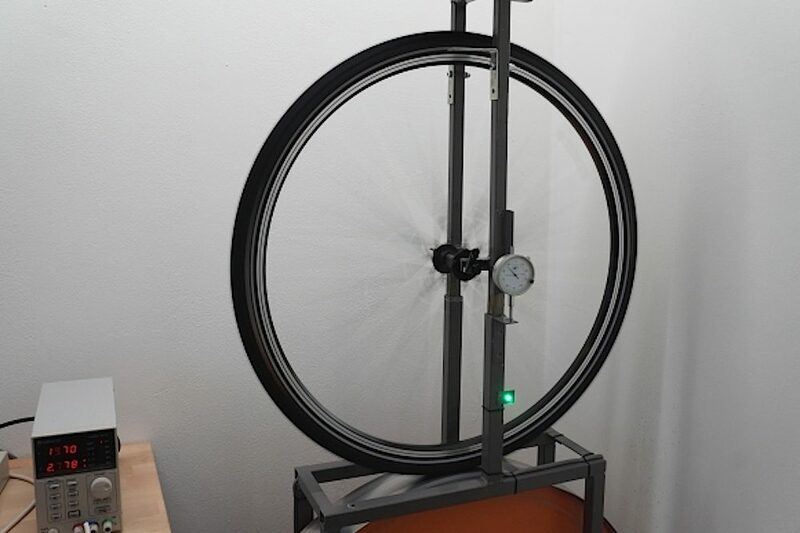 Bicycle Rolling Resistance is a website that conducts lab testing of bike tyres. They focus mostly on rolling resistance but also test the puncture resistance of the tread and sidewalls. 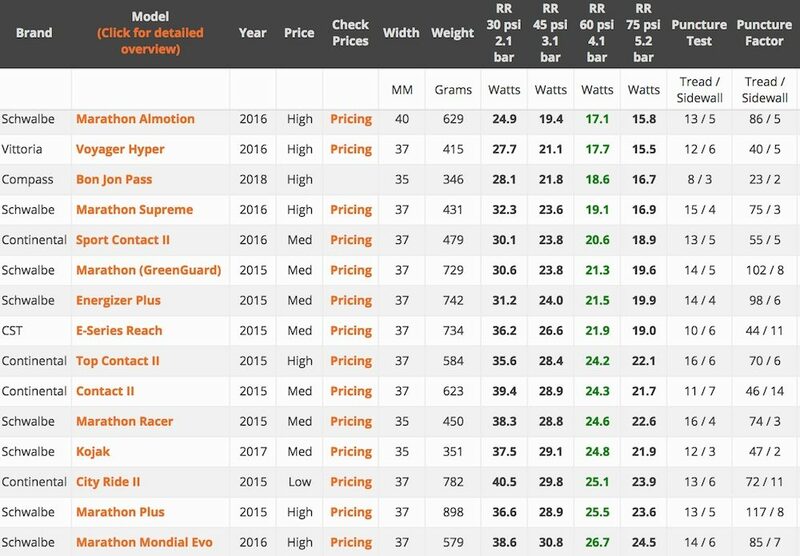 We are fortunate enough to have data available for 19 different touring tyre models to examine. Recommended reading: what is the most puncture resistant touring tyre? How Is The Tyre Rolling Resistance Tested? Tyres are tested on a 77cm steel drum which is covered with a diamond plate to simulate an average road surface. An electric motor spins the drum to 200 RPM (29 km/h or 18 mph) with a tyre and 42.5kg load resting on it. A microcontroller calculates the average power required to keep the drum at 200 RPM over a period of 30 seconds. A correction is made for the electric motor efficiency. The test is conducted three times and the average of the three is the rolling resistance of the tyre. Is This Form of Resistance Testing Legitimate? Steel drum testing is not perfect, but it’s able to get consistent results. This is because wind speed, temperature, power input and rolling speed can be controlled to a very high level of accuracy. My only concern is with regards to the correlation between tyre pressure and rolling resistance. A steel drum indicates that higher pressures equate to lower rolling resistance. The thing that drum testing doesn’t take into account is vibrations. The folk at Bicycle Quarterly have found that vibrations slow you down when your tyres cannot deform adequately. We’re talking about tyres that are running very high pressures or tyres with stiff sidewall casings (or both). If a tyre cannot deform over a bump, our bodies may absorb most of this energy. If the tyre can deform over a bump, the energy is temporarily stored in the tyre then released once you’ve travelled over it. With this in mind, we should look at the rolling resistance figures while somewhat disregarding the tyre pressure trends. Let’s focus on the rolling resistance difference between each of the tyres at the 45 or 60psi pressures. The results show that there is a great difference between the fastest and slowest tyres. The tyre with the highest rolling resistance was 95% slower (32.6w) than the tyre with the lowest (17.1w). Even between the first and fifth fastest tyres, there was a 25% difference in energy loss. That’s enough to lose you a fair bit of time on a long day. 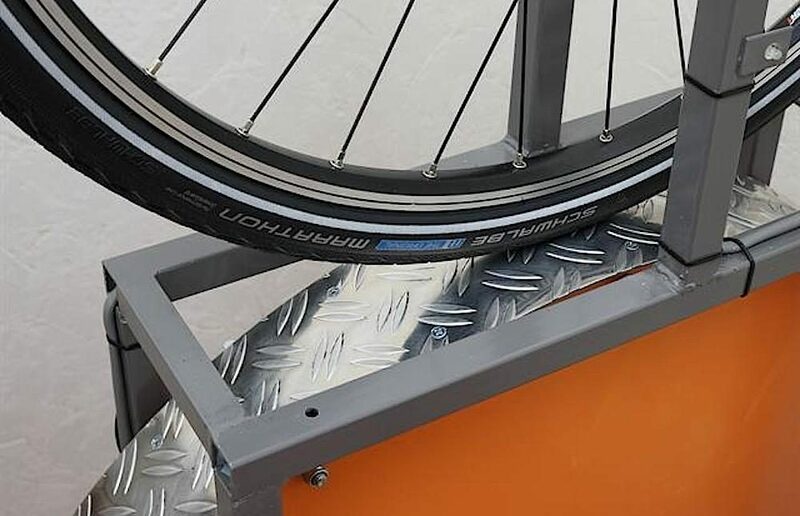 The king of this rolling resistance test is the Schwalbe Almotion. This is despite it being heavier than nine other touring tyres, suggesting that tyre weight isn’t necessarily a big factor. The key to the tyres success seems to be more to do with the composition. In this case, the Almotion uses the same rubber compound as their fastest Schwalbe road racing tyre. There didn’t seem to be a strong correlation between puncture resistance and speed either. 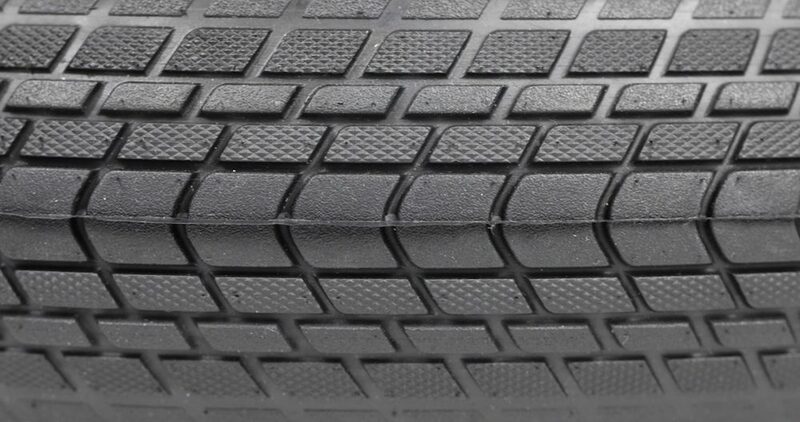 If we take the top-9 and bottom-9 puncture resistance scores and average them, the tread protection is only 2 points higher in the bottom-9 (15 vs 13) while the sidewall protection is the same (5 vs 5). There isn’t a great difference in average tyre thickness either. The average for the top-9 is 5.28mm and the average for the bottom-9 is 5.98mm. 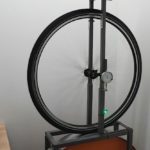 What Is The Difference in Cycling Speed Between Tyres? 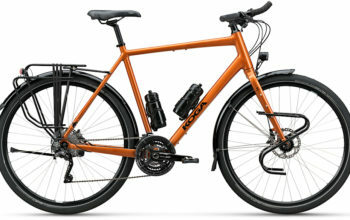 Rolling resistance on a touring bike is particularly important when compared to faster travelling bikes, like a road bike. This is because aerodynamics play a reduced role in a touring bike’s overall speed. The speed difference between slow and fast rolling tyres is very significant – in fact, it may surprise you that the effects of weight pale in comparison. Comparing the Schwalbe Almotion and Schwalbe Mondial there is 19.2w of extra resistance overall (two tyres). This translates to about 1.49km/h (0.93mph) slower travelling speeds on the Mondials with all things being equal (150w, 85kg total weight, flat road). Knowing the speed difference, we can determine the time differences over the course of a typical touring day using Bike Calculator*. 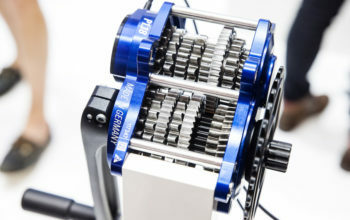 Over 100km, the 1.49km/h drop in speed from the Mondials will add 11 minutes and 49 seconds to your cycling time (5.4% slower). 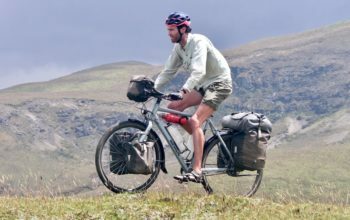 To put that into perspective, carrying 30kg (66lb) extra on your touring bike would add 7 minutes to your ride time (3.2% slower) over 100km. 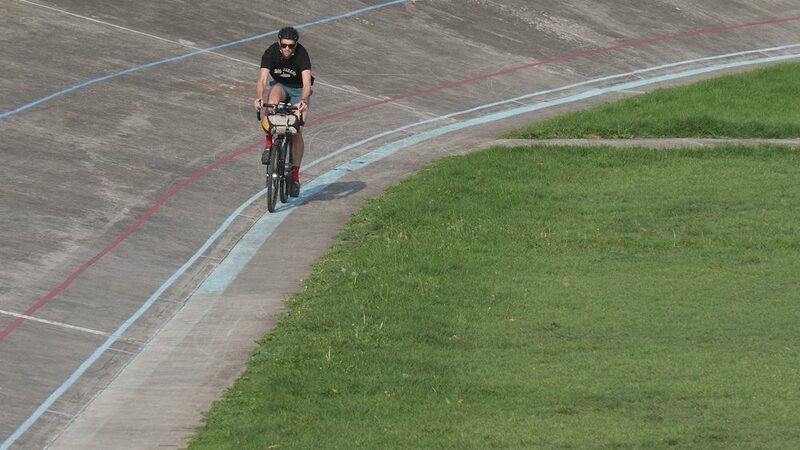 Assuming it’s hilly, rolling resistance plays an even greater role because of the lower travelling speeds. The slower Mondials add 18 minutes to your cycling time (7.0% slower). 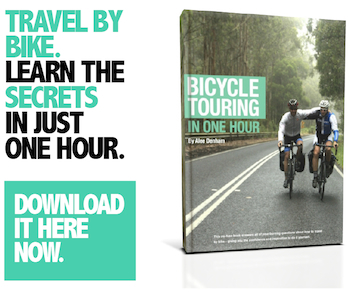 To put that in perspective, carrying 20kg (44lb) extra on your touring bike would add 17 minutes to your ride time (6.8% slower) over 100km. *Through my weight testing, I’ve determined Bike Calculator to be close to accurate. 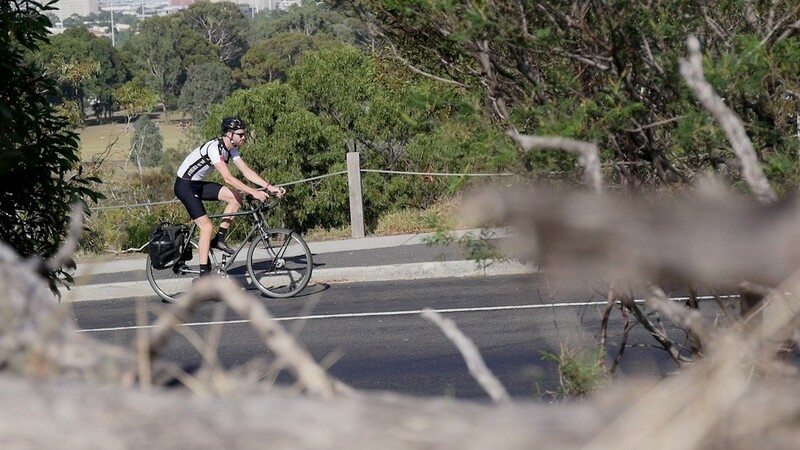 Low rolling resistance tyres can offer the same time savings as 20kg less bike weight on moderately hilly route. Does Tyre Speed Really Matter? If speed is your aim, stop thinking about how to shave a kilogram off your kit and start looking at fast tyres. The rolling resistance difference between our two examples can be equated to adding 20kg or more to your bike. 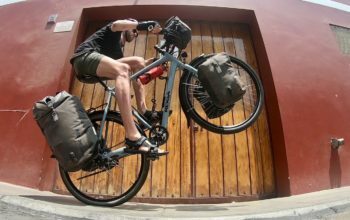 It can be just as significant as the aerodynamic benefits of bikepacking bags over panniers. That’s a lot! Yes, I know that touring isn’t really about speed. But if you can travel 5-7% faster using the same amount of effort, how is that not a good thing? Even if you don’t care for the increase in speed, you’ll be able to travel every day with less effort. That will leave you with more energy by the day’s end. 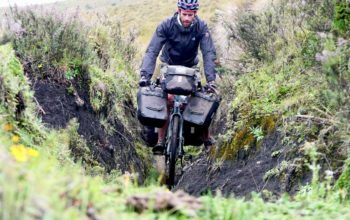 Rolling resistance can contribute to the same speed difference as the aerodynamic benefit of bikepacking bags over panniers. Alee, the rolling resistance savings are huge! Should I swap my tyres? Not necessarily; rolling speed is only one factor in the tyre equation. You will want to match the tyre width and tread pattern to the terrain you ride. If dirt roads are your jam, you’ll want wide tyres with tough sidewalls and a bit of tread. The looser, rougher and more rocky, the more tread will be required. If you’re on the road, then the low resistance tyre options from Schwalbe, Vittoria and Continental look to be excellent. For touring you may also want a tyre that is durable and long-lasting. If you’re completing a long tour, it’s nice having tyres that go and go and go. I have managed to squeeze 25,000km out of my Schwalbe Marathon Mondial tyres. I can only guess that the Schwalbe Almotion is not capable of this kind of mileage. 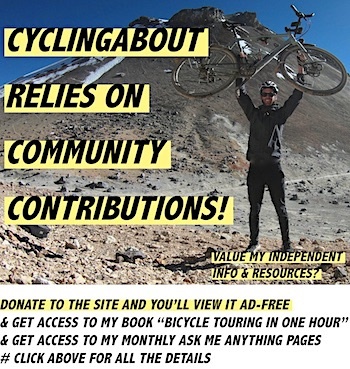 Wanna help support CyclingAbout? Grab some tyres from Amazon by using the links below & CyclingAbout gets a tiny bit from each sale. No cost to you, easy as pie!